Rotation should be viewed as a way to maintain or increase profits and improve soil cropping conditions. Although labor, equipment, and soil type all may limit the types of crops you can grow, rotation is still an essential component of any management plan. Whether your operation grows a few crops or many, crop rotation needs to be well planned and adapted to suit your current land conditions and market demands. Growing soybeans continuously increases the possibility of diseases, insect infestation, weeds, and nematodes. A well-planned crop rotation system can help growers avoid many of these problems in addition to reducing economic and environmental risks, improving soil health, and increasing yields. Crop rotation is an effective tool for disease management, particularly for soybean diseases that overwinter in crop and residue and soil such as stem canker, Cercospora, frogeye leaf spot, and Septoria brown spot. By introducing a crop that is not a host to the pathogen, the pathogen is unable to reproduce and inoculum in the soil or crop debris gradually decreases over time. In contrast, when the soybeans are grown year after year the pathogen is able to survive and reproduce each year. Inoculum levels continue to increase and eventually you are likely to have problems. 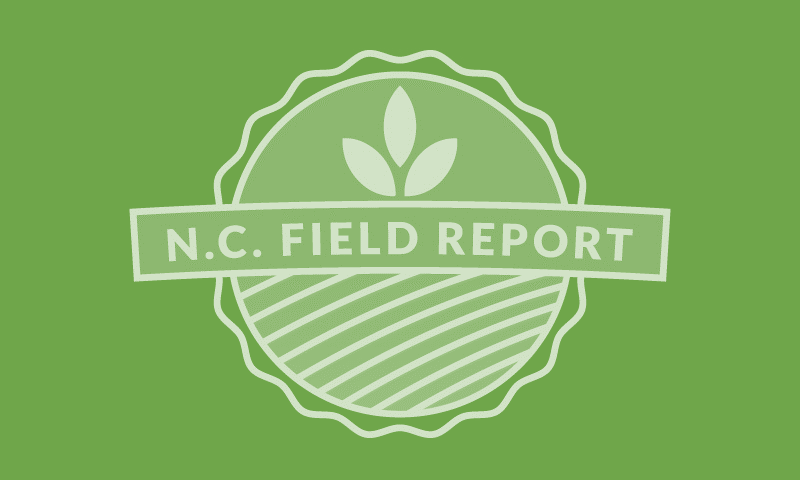 Nematodes are probably the most damaging pest/pathogen of soybeans in North Carolina. Soybean cyst nematode (SCN) populations can be reduced dramatically when rotating to a non-host crop. Many of the crops available for rotation in North Carolina are not hosts (corn, cotton, wheat, tobacco). If a nematode assay (more info on nematode sampling here) shows high levels of SCN it is best to plant a non-host crop for at least two years to reduce the population. Crop rotation may also be an effective management tool for helping decrease the populations of some insect pests. You are more likely to see problems from three-cornered alfalfa hopper, Dectes stem borer, bean leaf beetle and stink bugs in non-rotated fields. Diversification of a weed management program is essential to combating herbicide resistance. Rotating different types of crops allows growers to diversify their weed management strategy by being able to use different tillage practices and herbicides with different sites of action. Adding cover crops to your rotation can also help reduce weed pressure. Having several crops in a rotation can help mitigate risks from weather events. If different crops experience drought or excessive rainfall at different growth stages, the impact of a weather event affects the yield of those crops differently. In addition, crop rotation can help spread the workload during the growing season. In addition to pest and risk management, crop rotation increases yield of all crops in the system. 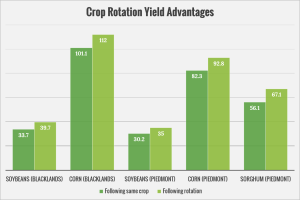 Numerous studies across the nation have demonstrated the yield advantages of crop rotation. In two long-term rotation studies carried out by NCSU in the Blacklands (Washington County) from 1972-1993 and in the Piedmont (Cleveland County) from 1985-1994 the yield advantages were quantified. In the graph below you can see where soybean yields were increased by about 5 bu/acre following corn compared to following soybeans. Data from Dr. Jim Dunphy, NCSU. We have been called to visit quite a few soybean fields this season where the grower is seeing problems they can’t identify. In each of these fields, it’s obvious there are actually many pests contributing to the problem. The common theme in most of these fields are soybeans have been planted back to back for over five years. Planting any crop back to back year after year increases the potential for pests and problems to build up. You may not see these problems after one year, but eventually, something will become an issue and it may be a problem that is difficult to control. Strategically plan your crop rotations to help avoid these issues as much as possible. The Benefits of Crop Rotation. http://www.sandsofiowa.com/images/E0240401/CropRotationBenefits91914.pdf.